What is the VARA Function? The VARA Function is categorized under Statistical functionsFunctionsList of the most important Excel functions for financial analysts. This cheat sheet covers 100s of functions that are critical to know as an Excel analyst. VARA is very similar to the VAR function. It will calculate the sample variance of a given set of values. Variance is a statistical measure used across a set of values to identify the amount that the values vary from the average value. As a financial analystCertified Financial AnalystCFI Financial Modeling & Valuation Analyst program is your path to become a certified financial analyst. With 12 required courses on topics ranging from accounting and finance fundamentals to financial modeling, valuation and advanced Excel skills, the CFI financial analyst certification will help, the VARA Function can be useful in calculating variance in revenue. Portfolio managersPortfolio ManagerPortfolio managers manage investment portfolios using a six-step portfolio management process. Learn exactly what does a portfolio manager do in this guide. Portfolio managers are professionals who manage investment portfolios, with the goal of achieving their clients’ investment objectives. often use this function to measure and keep a track of their portfolio risks. Number1 (required argument) – It is the first argument corresponding to a population. Number 2,.. (optional argument) – Here, the number arguments can be up to 254 values or arrays of values that provide at least two values to the function. However, we can only enter up to 30 number arguments in Excel 2003 and earlier versions. We can enter up to 254 number arguments to the VARA function in current versions of Excel (2007 and later). However, we can only enter up to 30 number arguments in Excel 2003. VARA is used when we are calculating the variance for a sample of a population. 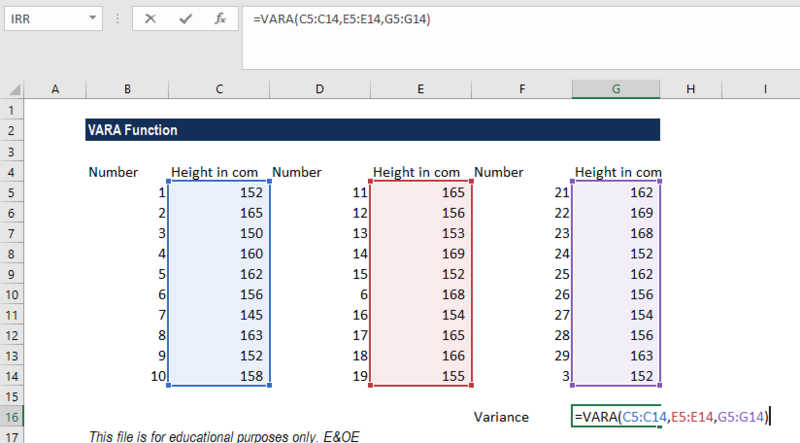 If we wish to calculate the variance for an entire population, we should use the Excel VARP function. When an array of values containing logical values is provided, VAR ignores logical values whereas VARA will assign the value 0 for the FALSE logical value and 1 for the TRUE logical value. Text – including empty text “”, text representations of numbers, or other text – within arrays or reference arguments are ignored by VAR but counted as zero by VARA. 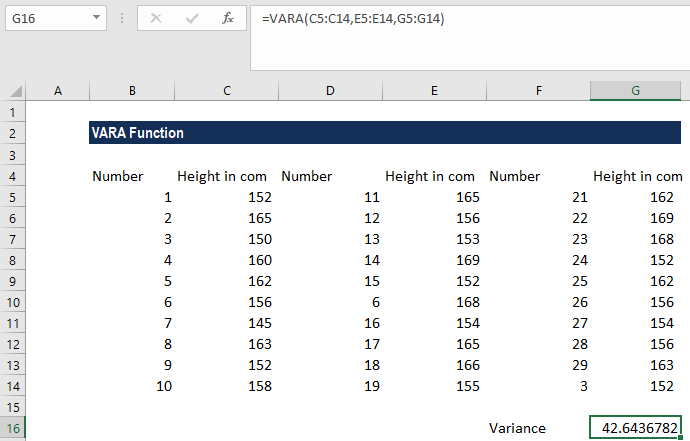 How to use VARA to calculate variance in Excel? In the example above, we took the arguments for the VARA function as input in the form of three cell ranges. However, we can also enter the figures directly, either as individual numbers or number arrays. #DIV/0 error – Occurs if we did not provide any numeric values as arguments.